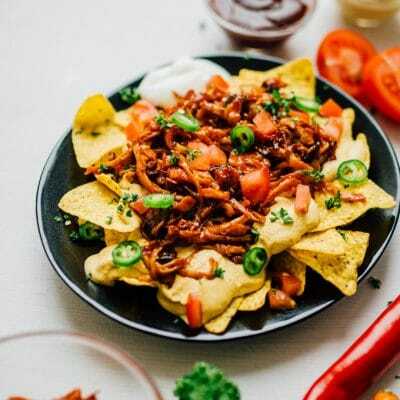 These vegan nachos are piled high with easy mushroom BBQ “pulled pork” and a cashew-based queso cheese sauce that will knock your dairy-free socks off. My quest for good Mexican food in the Netherlands has been…a struggle. Granted, my standards for Tex-Mex-ish cuisine is high, having lived in San Antonio right before moving here. But the flavors of food in Holland are meant to suit Dutch peoples’ tastes, which aren’t nearly as spicy or smoky. And sometimes a bit off the wall, like the time I ordered nachos and received a pile of cool ranch Doritos, marinara sauce, and crème fraiche. So for a while I resigned to the fact that Tex-Mex would be something to look forward to on my trips back to America. But when the nacho cravings hit, the only solution is to make nachos happen. 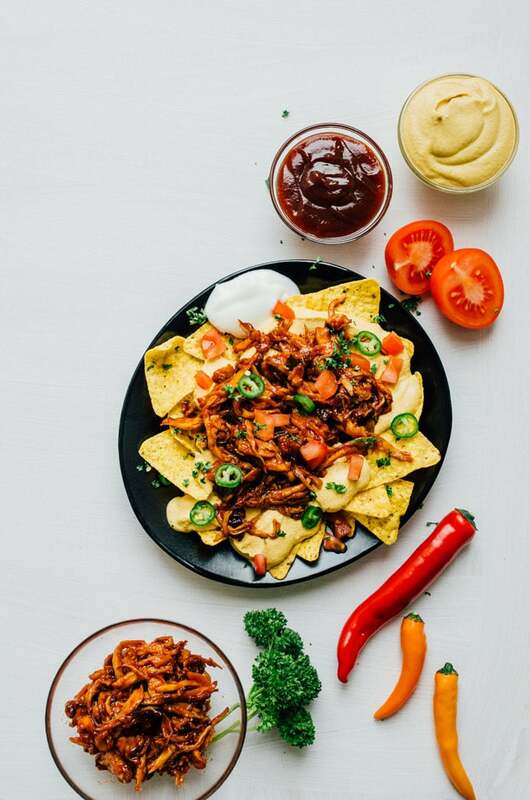 And when life gives you BBQ pulled pork mushrooms…you nacho. What can you put on vegan nachos? These nachos have two very important elements: the BBQ mushrooms and the queso. I introduced you to the sheer awesomeness of BBQ pulled pork mushrooms a few days ago, which basically involves shredding up king oyster mushrooms, seasoning, and baking. Then there’s the vegan nacho cheese queso, a creamy blend of cashews, smoky roasted jalapenos, and nutritional yeast. 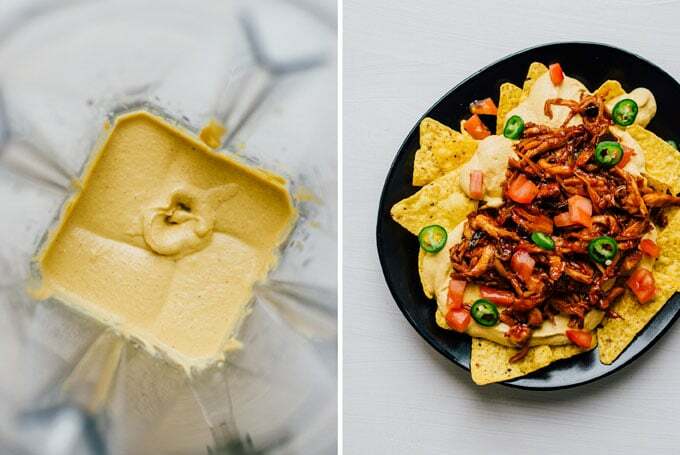 And it all comes together to make the most addictive vegan nachos! Pulled Mushrooms: Prepare BBQ pulled mushrooms (following these instructions – 10 minutes hands-on time, 20 minutes cooking). Queso: Soak cashews in water overnight (or in very hot water for 1 hour). Meanwhile, broil jalapeno on top rack of oven until blackened, then remove skin, ribs, and seeds. Finally, add carrots and a few tablespoons of water to a microwave-safe dish. Cover with plastic wrap and microwave until fork tender, about 4 minutes. Drain water. Blend all queso ingredients in a blender until smooth. 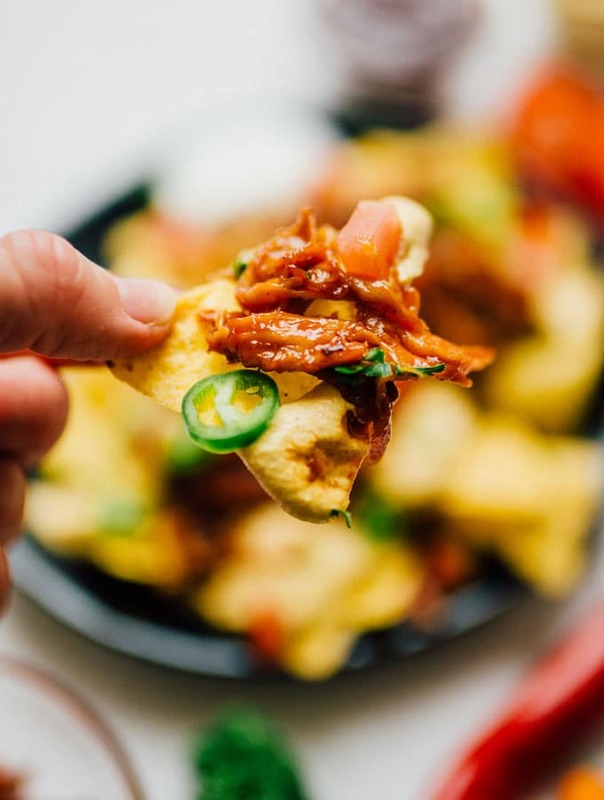 Serve: Top tortilla chips with cashew queso, BBQ pulled mushroom, and you favorite nacho toppings (like tomatoes, sliced pepper, and sour cream). 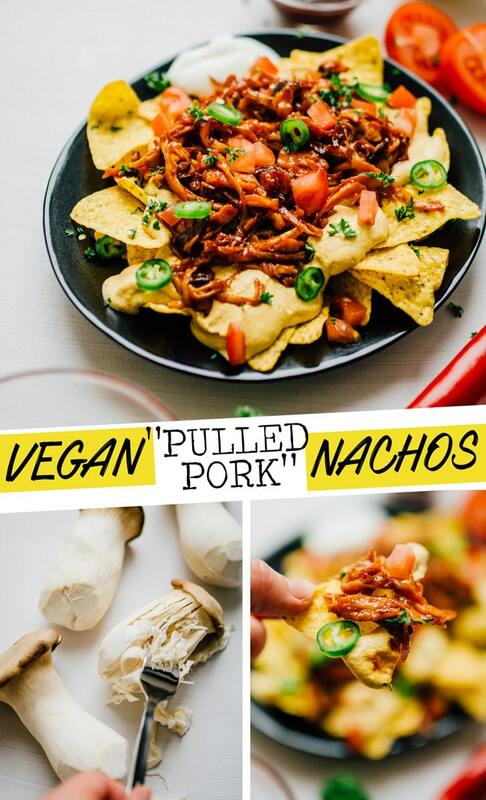 Thanks so much for dropping by and for making easy recipes like these vegan nachos possible! If you give it a try, be sure to snap a photo and tag #liveeatlearn. Does the carb count include chips? Its really high for me. My meals are supposed to be 30 carbs. Hi Lauren! Yep, the carb count includes chips. 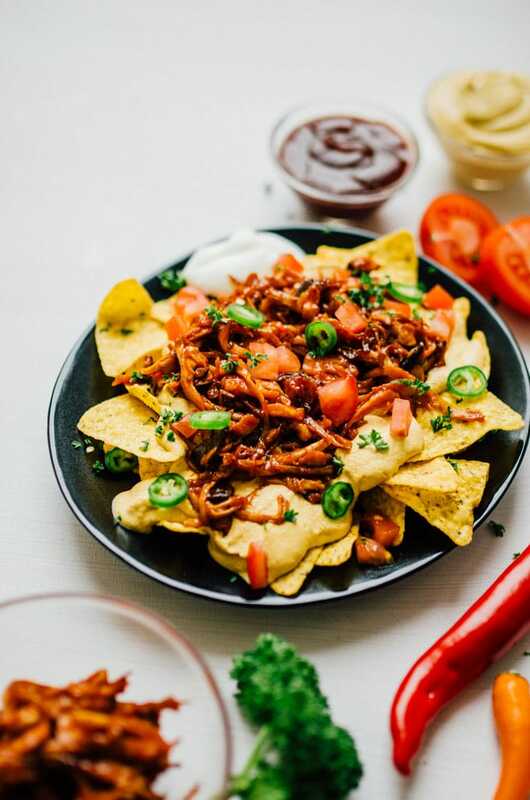 Maybe you could try a base like this: https://peaceloveandlowcarb.com/low-carb-nachos/, or perhaps bell peppers: https://www.homemadeinterest.com/low-carb-nachos/. This is also good with pulled jack fruit. Haven’t tried that before but would love to! I’m only hesitant because it’s so high in sugar.